Sensor output voltage fluctuates frequently in a certain time period. Sensor output voltage does not vary in a certain time period. EVAP pressure sensor less than 42.11009 kPa(abs) [315.86779 mmHg(abs)] for 0.5 seconds. 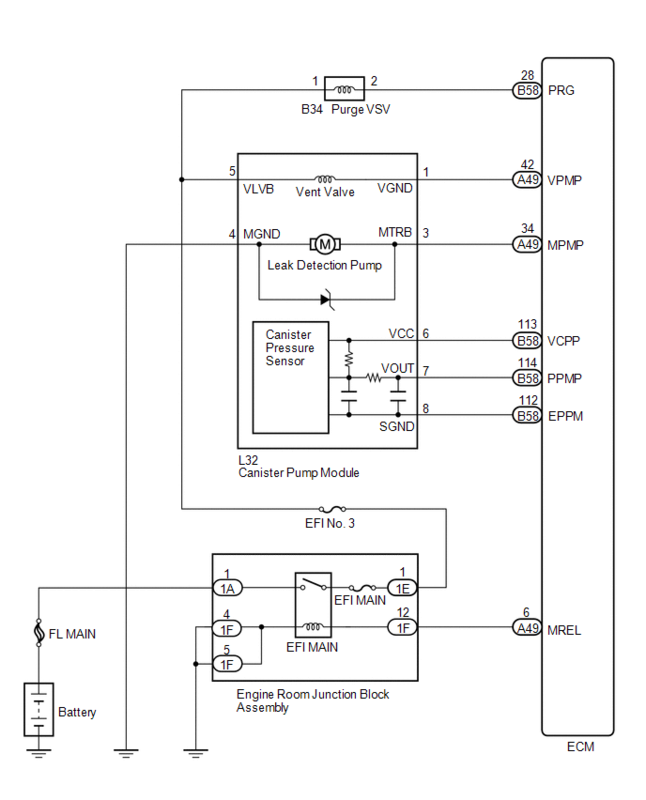 EVAP pressure sensor higher than 123.76147 kPa(abs) [928.33479 mmHg(abs)] for 0.5 seconds. The canister pressure sensor is built into the canister pump module. If the canister pressure sensor voltage output fluctuates rapidly for 10 seconds, the ECM stops the EVAP system monitor. 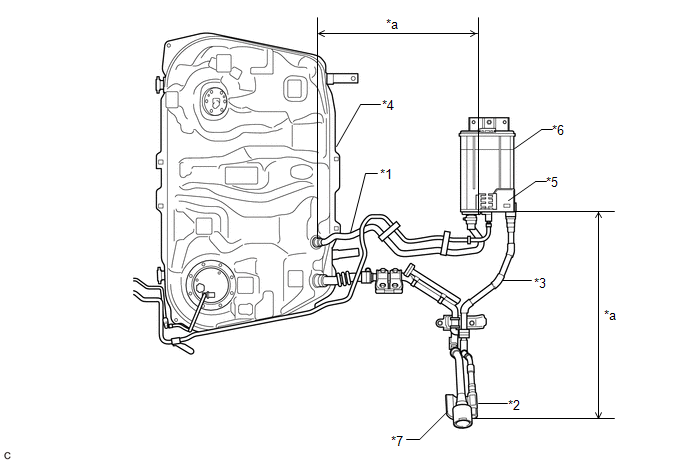 The ECM interprets this as the canister pressure sensor voltage fluctuating, and stops the EVAP system monitor. The ECM then illuminates the MIL and stores the DTC. Alternatively, if the sensor voltage output does not change for 2 minutes, the ECM interprets this as the sensor being stuck, and stops the monitor. The ECM then illuminates the MIL and stores the DTC. (Both the malfunctions are detected by 2 trip detection logic). 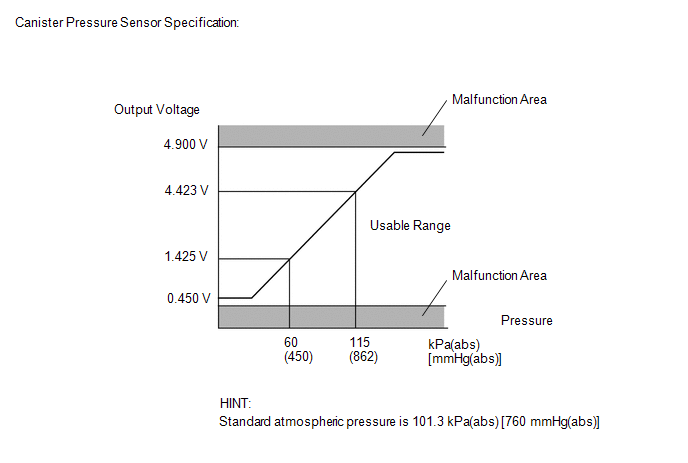 If the canister pressure sensor voltage output (pressure) is less than 0.45 V: 42.11009 kPa(abs) [315.86779 mmHg(abs)], the ECM interprets this as an open or short circuit in the canister pressure sensor or its circuit, and stops the EVAP system monitor. The ECM then illuminates the MIL and stores the DTC (1 trip detection logic). If the canister pressure sensor voltage output (pressure) is higher than 4.9 V: 123.76147 kPa(abs) [928.33479 mmHg(abs)], the ECM interprets this as an open or short circuit in the canister pressure sensor or its circuit, and stops the EVAP system monitor. The ECM then illuminates the MIL and stores the DTC (1 trip detection logic). Enter the following menus: Powertrain / Engine / Data List / Intake Air. Check that the intake air temperature is between 4.4 and 55°C (40 and 122°F). Input the DTC: P0451, P0452 or P0453. When a vehicle is brought into the workshop, leave it as it is. Do not change the vehicle condition. For example, do not tighten the fuel cap. (b) Turn the ignition switch to ON (do not start the engine). (f) Enter the following menus: Powertrain / Engine / Data List / Vapor Pressure Pump. (g) Read the EVAP (Evaporative Emission) pressure displayed on the Techstream. If the exhaust tailpipe has been removed, go to the next step before reinstalling it. (h) Perform the Evaporative System Check using the Techstream, referring to the Confirmation Driving Pattern. (j) Input the DTC: P0451, P0452 or P0453.